On 7th May there isn’t just the General Election. In Derby there are local elections as well. Regardless of who you vote for in the General Election, please consider voting Green locally. 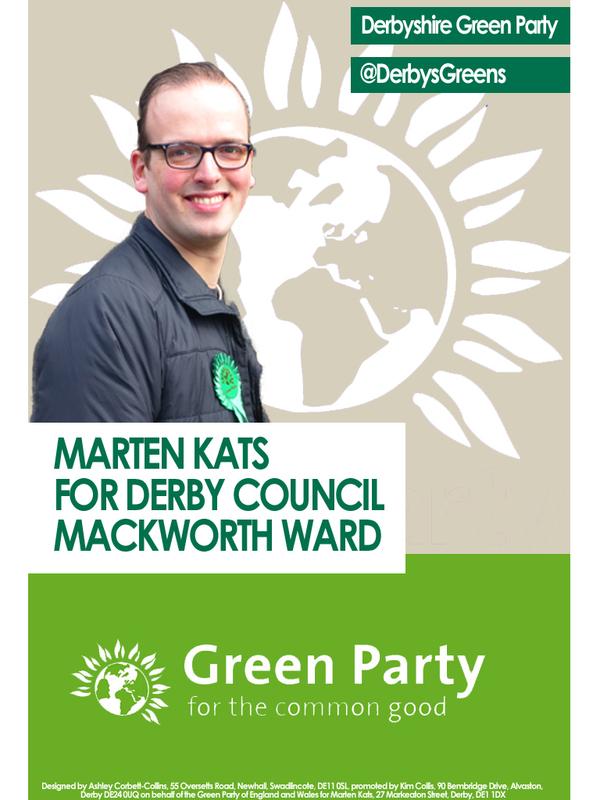 One Green councillor can make a big difference in Derby. I live locally and feel passionately about the area where I live. The reason why I am standing is that I think this city needs a Green councillor. Having at least one Green councillor can make a big difference. We can get our voice heard in the council, stand up against recycling cuts like the brown bin tax and the removal of blue bins, while fighting the Sinfin incinerator that will cause health problems to local people. We will fight for our green spaces and tackle housing issues, partly by making better use of empty buildings. If I get elected, I would address local issues in Mackworth, engage with local people and be a voice for them. Mackworth needs a safe crossing for children to Markeaton Park, a place to hang out for teenagers, measures against anti-social behaviour, better public transport, activities for elderly and more attention to traffic and parking problems. Vote Green on 7th May for a different voice on Derby City Council. Government needs to follow the lead of groups across the country who are looking at how their communities can address climate change and declining oil reserves. In Derbyshire Dales we have Sustainable Youlegrave, Sustainable Bakewell and Transition Town groups in Matlock and Wirksworth all looking at how we can move to low carbon lifestyles through initiatives around renewable energy, energy efficiency, local food production and transport issues. This is the bottom-up approach and demonstrates the support out there for programmes to tackle these issues. On waste, we support increased investment in recycling, creating jobs whilst improving the infrastructure to allow people to do the recycling and move toward zero waste. Let’s do the simple things like free compost bins to anyone who wants one. We would oppose incineration even with energy recovery, as it includes recyclables and plastic. We would like to see local government take a lead on identifying suitable sites for wind turbines rather than spending tens of thousands of pounds in opposing applications. We support investment in renewable energy production alongside home insulation initiatives and improved public transport and believe this will create thousands of jobs. Josh Stockell is 45 and has two children. He has lived in Wirksworth , where he is self-employed as a joiner and cabinet maker, for 15 years. Josh first stood as a Green Party candidate in the 1980s in Nottingham and he has stood in city, town, district and county council elections. In 2007 Josh was elected to Wirksworth town council where he sits on the planning and environment committee. He is also a community governor at the local junior school where he volunteers as a classroom assistant for one day a week. Josh enjoys walking, is a keen cyclist and plays football regularly. He also coaches a local u16 girl’s football team and is involved in the management of the local skate park. There is a proliferation of new waste disposal technologies, these need to be carefully evaluated in terms of their carbon footprint. Some are good, some less so. The Greens are not against new technology. While domestic waste is coming under control and is now decreasing in England and Wales (around 27 million tonnes annually) commercial and industrial waste continues to grow, though it has been kept in check by the recession. Industry is not yet covered by direct targets on waste. These will come in via European legislation which the Green Party supports. This should help industry wake up to the fact that waste is an avoidable cost, and also represents a loss of potential profit. The Green Party calls for waste minimisation as a priority, then reuse, recycling and recovery of value (including) energy, and finally landfill. In principle, we would support the concept of zero waste, in practice the policy recognises that it will take time and investment to achieve this. Green Party policy opposes incineration. The reason is that it represents a waste of resource and thwarts our long-term aim of zero waste. However, the issue of pollution as a result of incineration can be overstated. All modern incinerators now operate under the Waste Incineration Directive. They are the cleanest of combustion plants, cleaner than roads! The main problem with incinerators from our point of view is that they conform to the centralist economic/political model rather than the decentralist strategy that we propose. They tend to be large, ‘industrial-scale’ plants which require inputs (including waste) to travel large distances to make them viable. Green Party policy is cautious on gasification, the technology rejected in Derby. It looks like the technology proposed would incorporate plastic in the gasification process, in which case the energy output, be it gas or electricity, would not be renewable. This is one of our reasons for opposing it. In addition, it looks like it is a big facility bringing waste in from all over Derbyshire, adding up the transport carbon footprint, again reason for opposition. It is unlikely that emissions would be a serious issue, gasification occurs necessarily in a closed low oxygen environment, so emissions are minimised. The question about the ‘bottom ash’ remains. Anaerobic Digestion (AD) is generally welcomed, though it has limitations that policy-makers need to understand. It causes only a partial breakdown of the biomass content of waste, a significant residue remains for disposal. This can be used for compost if it is clean, that requires full screening of the input waste, which involves expense. The residue has to have a long-term market. Land has a limited capacity for taking applied compost: over-apply it and methane will be produced. The markets also need to be nearby so that transport miles are not being stacked up. Therefore, AD is good on a small scale in rural areas and with a segregated waste stream, e.g. food and garden waste, doubtful for big urban areas, and still need waste segregation and a solution to residual waste. The Green Party calls for more recycling and curbside segregation, however some curbside schemes seem to be getting out of control. Stockport now has a 3 or 4 bin system. We should consider the carbon footprint of all these bins, which are made from petrochemicals, and be sure that no further collection miles are being created compared to a single bin collection. In some residential areas such as flats, segregated bin systems do not work, so to meet targets, some form of waste processing is necessary. In cities it might be better to go back to single bins with weekly collections and invest in clean, state of the art materials recycling facilities with energy-generation to power the process and the collection fleet. Such a closed cycle system is technically possible now.